With the “graphical inventory plan” you can even graphically rebuild the equipment of your rooms. You position your objects and then see at a glance, where, for example, tablet, couch or PC are placed in the room. Each room plan starts with a standard layout, as a rectangular room, which you can customize according to your measurements. Now you can place and arrange your equipment and furniture in it. To do this, the objects from the Asset.Desk tree can be simply dragged and dropped into the room. If you have previously maintained the dimensions of the objects, they will be displayed in the plan with the correct dimensions. Properties of the object, such as length, width or also the rotation of the object, can be simply enterd or changed in the plan directly with the mouse. Furthermore, general properties such as e.g. the inventory number or the IP address of the PCs can be listed. Walls can be edited, split and moved. 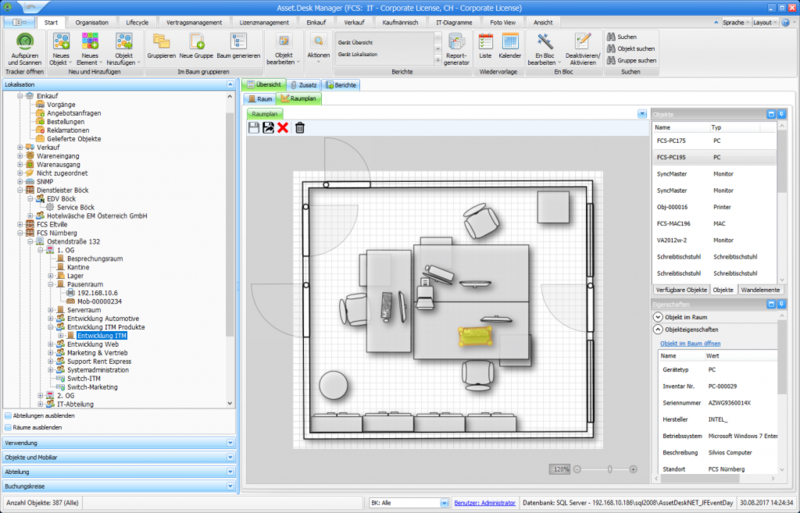 You have the ability to place windows and doors – all with graphical support and a mouse click. Wall elements in the room are selectable, movable – and interactive. The “graphical inventory plan” is linked to the Asset.Desk database. By clicking on an object you go directly to its details, and you can check and edit all the information from the inventory database, to equipment to purchase price, guarantee periods up to invoice number and supplier.